(2) It is possible your ancestors were not Native American by blood. 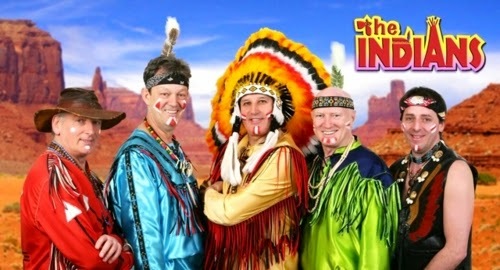 Irish rock band The Indians. Used here as satire. No disrespect intended. This one can be hard for many of you because your DNA results may contradict what you believe or have been told about your fabled Native American ancestry. Let's say you have evidentiary proof that one of your 2nd-great-grandparents were enrolled into a tribe and belonged to a NA family, but your DNA results show 0.00% NA DNA. In this instance it's possible for your 2nd=great-grandparent to have been Native American by adoption, marriage or some other circumstantial situation where a legal (not genetic) relationship can be established. 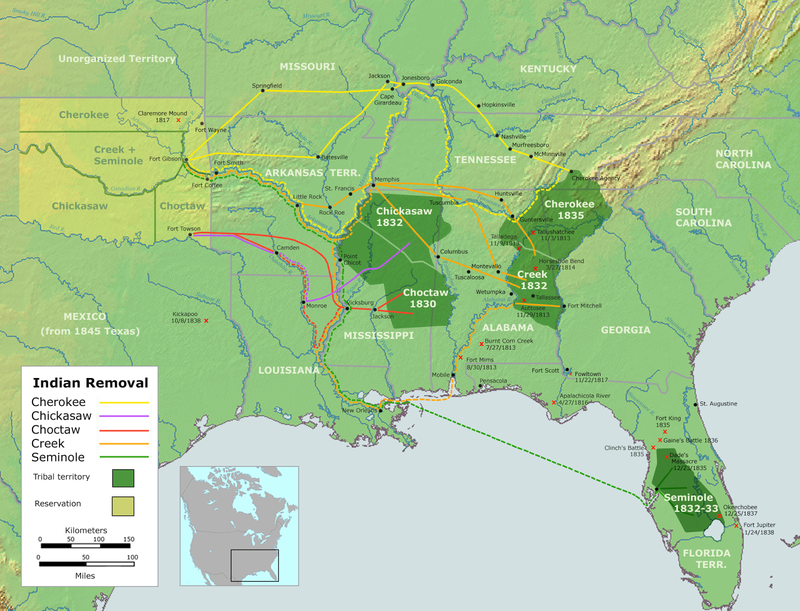 For example Freedmen (former African slaves of Cherokee, Choctaw, etc) and free persons of color (ie Black Seminoles) are enrolled tribal members, but not all of them "cohabitated" with Native American-descended members of their tribe. In Northeast US and Canada the French allied with indigenous tribes [see French & Indian War] and lived among them, but this could have excluded genetic material being exchanged between the two groups in many instances. Also consider other Asian populations like Filipinos, Chinese, Polynesian and Malagasy populations that came to the Americas by freewill or force. In the 18th and 19th centuries many of these Asian populations were often been lumped together with Native Americans especially for racial classification purposes. Of course these Asian groups also intermixed and lived with Native American populations like the Filipinos of the Nooksack Tribe and Filipino Mexicans, which have been arriving to Mexico since the 1500's. Some DNA tested Mexicans today show haplogroup assignments more commonly found in Filipinos. As such your results may show Asian DNA percentages from a REAL Asian source instead of a Native American on. It's also possible for your ancestors to be from such Native American tribes as Lumbee, Ramapough Mountain Indians, and Cherokee -- these populations have members with multiple ancestries. So the NA DNA you thought you were inheriting from these ancestors might turn out to be a REAL Asian, African, European or Middle Eastern component. Likewise you may UNKNOWINGLY descend from other such multi-ethnic isolate populations as Melungeons, endogamous populations as Jewish, or nomadic populations as Romani (South Asian), all of which are often misconstrued as Native American. Inevitably you will have to examine your genealogical history honestly and thoroughly to decide whether or not your ancestors had a cultural and/or genetic connection to Native Americans especially if your DNA test(s) are suggesting otherwise. (3) The DNA Test has a problem assigning Native American DNA to your genome. Can you blame the DNA test for not detecting Native American DNA in your genome? The answer might be YES, and here's why: First, the percentage of your genome utilized for these genealogical DNA tests is very small. Most personal genome services (23andMe, FamilyTreeDNA, AncestryDNA) analyze anywhere from 400,000 to 700,000 ancestry informative markers (more commonly SNPs) out of a potential 15 million (the human genome has about 3 billion base pairs [see ISOGG's Autosomal DNA Comparison Chart]. A new test on the market TribeCode sequences 12 million markers using Next Generation Sequencing methods. Imagine if we could test all potential 15 million AIMs/SNPs, or better yet the entire genome to make sure not one marker for ethnicity genotyping is missed. Well according to Dienekes Utah Whites vs.Tuscan study with 1.5 million SNPs, it might not make much of a difference. Dienekes study says, "We should note that increasing the number of markers has diminishing returns: most new markers are in linkage disequilibrium with existing markers, and hence provide little additional information: going from 10 to 110 markers has a huge effect, but going from 1000 to 1100 a trivial one. ... The conclusion is obvious that the 5-fold increase in markers from 300K to 1.5M had no noticeable effect in the apparent mixed-ness of populations and individuals." However I suspect going from 400-700K to 1.5 million, or even 12 million (Tribecode), is NOT trivial as long as the algorithm and proprietary analysis is able to adequately process and report the data. Your DNA test has other problems during the genotyping process. For example, there are no-calls (the analysis can't adequately detect your genotype at the SNP location), miscalls (the resolution is low at certain SNP location leading to the algorithm to make a mistake or guess your genotype at that SNP location), deletions (SNPs get deleted during genotyping process), insertions (SNPs get inserted during genotyping process), smoothing (your data is modified to capture the most important data by removing presumable noise) and imputed DNA values (basically computer guesses based on statistical probability). All of this could further negatively affect your ethnic admixture scores or lead to it not being reported at all. In another example, Genetic expert Dr. Doug McDonald told one of my relatives with 1% Native American and 0.78% East Asian that "0.003 of the E. Asia is borderline and MAY be actually Native American." Since Dr. McDonald's BGA analysis is thought to be excellent at detecting Native American ancestry, the seemingly trivial 0.003% amount still lends credence to your Native American DNA getting possibly assigned as something else especially if the SNPs tested at a location clusters with both Native American and East Asian populations (and more true if you tested at more than one reputable DNA company, and one shows NA but the other didn't or labelled it something else). Dr. McDonald says in an interview, "Native American is listed as just that. It is quite uncommon for it to be listed in error … except for genuine people from Siberia and Saami. FTDNA does not mistakenly show American as Asian. “Mayan” is the usual listing for any Native American north of Panama, through all of Mexico, and east of the Rockies in the USA and Canada." For more information on how the most popular personal genome companies assign DNA, please see 23andMe Aggregating and Assigning, FTDNA White Paper & Methodology and AncestryDNA White Paper. Poor sampling of indigenous populations in the Americas can often lead to DNA tests missing your Native American DNA. 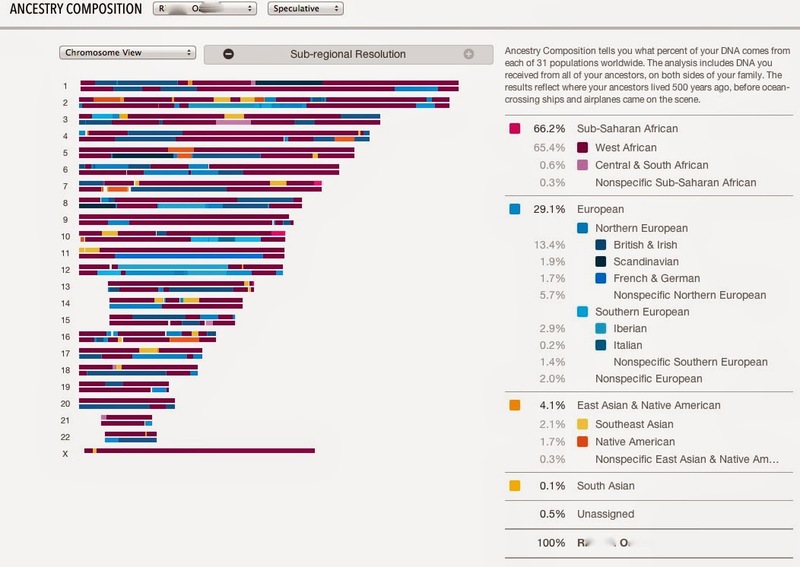 For example, 23andMe's Ancestry Composition uses Maya (25), Pima (25), Karitiana (24), Colombian (13) and Surui (21); FamilyTreeDNA's myOrigins utilizes Karitiana (23) and Surui (21); and AncestryDNA's Ethnicity Estimate boasts 131 individual, but uncategorized, reference samples (HGDP, AncestryDNA). Note the low quantity of samples and limited biogeography represented. Skeptics might argue that these reference populations are sufficient enough to detect some Native American DNA in your genome, especially since indigenous populations appear to have some degree of endogamy [see Clovis Boy discovery]. However other scientific studies suggest Native American groups do have differences [see Paul Verdu et al. ], including the obvious uniparental markers/haplogroups [see Bolnik DA, Smith DG], and that poor Native American sampling hampers granularity and resolution. Another report says: "The weakness of the genetic tests poses an even bigger problem when you're looking for Native American ancestors. Native Americans have been reluctant to participate in genetic testing, which means scientists don’t have many reliable markers for that population. In addition, the genetic profiles that have been conducted show that many card-carrying members of certain tribes, such as the Cherokee, have more European ancestors than Native American ancestors. That means even the small number of Native American genetic markers we know of aren’t present in large segments of the population, making it difficult to find evidence of Native American DNA...." As such little is known of the full extent of Native America populations markers/mutations or how much they mixed with each other prior to colonization from Europeans. When my relative (with known Native American ancestry from northeast USA) transferred her 23andMe raw data results to DNA Tribes for a (third-party) SNP analysis, her report showed lots of Southeast Asian categories (which we now know is Malagasy ancestry). So we asked DNA Tribes if those Asian components were likely related to her Native American ancestry or is it some sort of real Southeast Asian? DNA Tribes' late founder Lucas Martin replied, “Native American ancestry from tribes not sampled in our SNP database (such as northeastern U.S. and eastern Canadian tribes) can be expressed in region and population components from other parts of the Americas and in some cases Asia,” including Karitiana Brazil, Miao China, Hazara Pakistan, Thailand, Daur China, Mongol Mongolia and Cambodian." Thus, until more Native American (and Asian) references samples are added -- especially from Eastern USA and Canada -- your Native American DNA has a good chance of being assigned as something else or not at all. SO WHAT CAN YOU DO IF YOU SUSPECT YOUR NATIVE AMERICAN DNA IS HIDING IN THE TEST? Use Third-Party Tools. 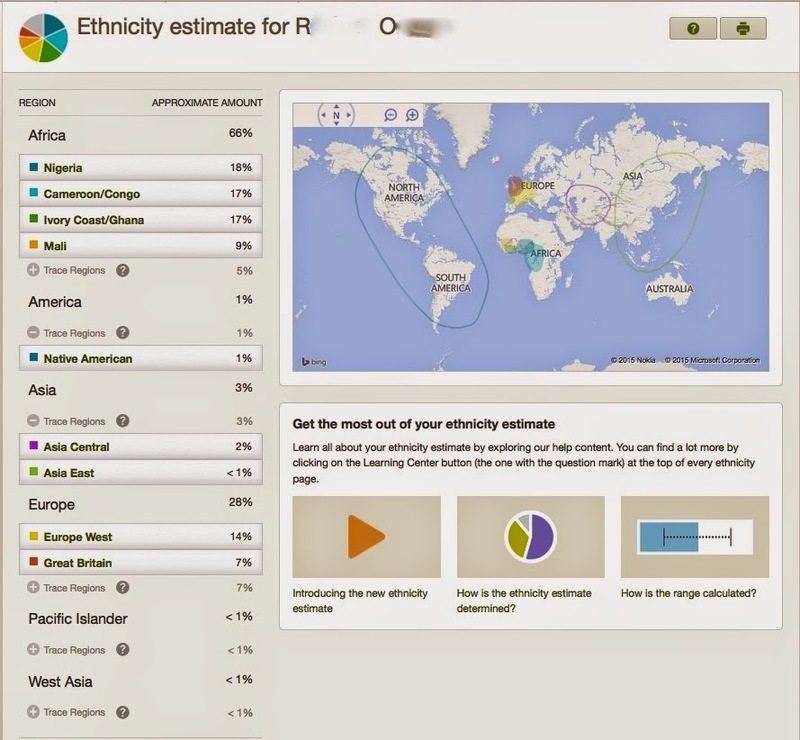 I recommend downloading your raw data from 23andme.com, FTDNA, AncestryDNA raw data and uploading to Gedmatch.com, a FREE third-party site with great genealogy tools (especially admixture calculators) which may pick up ethnic components missed by major DNA companies. (The best admixture calculators at Gedmatch are: Dodecad World9, Eurogenes K13, MDLP World-22, Eurogenes K36 or in some cases HarappaWorld). For a great guide on using Gedmatch tools and other third-party sites to find Native American DNA, please read The Autosomal Me – Rooting Around in the Weeds Using Third Party Tools Posted by Roberta Estes section on Gedmatch.com. 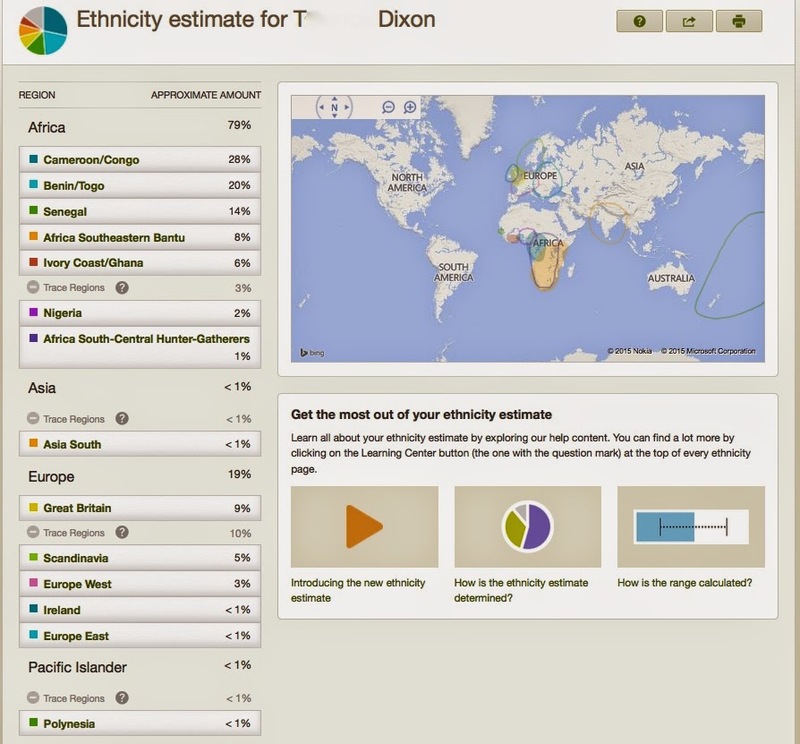 Check your DNA company's ethnic admixture reporting thresholds. Every company sets their own reporting threshold for their atDNA test. Some don't report percentages lower than 2%, while others go as low 0.1%. If the amount of ethnicity detected in your DNA analysis is below this threshold it simply will not get reported. For example, a relative with a documented Cherokee ancestor (born about 1775) tested at 23andMe and received 0.5% NA DNA. 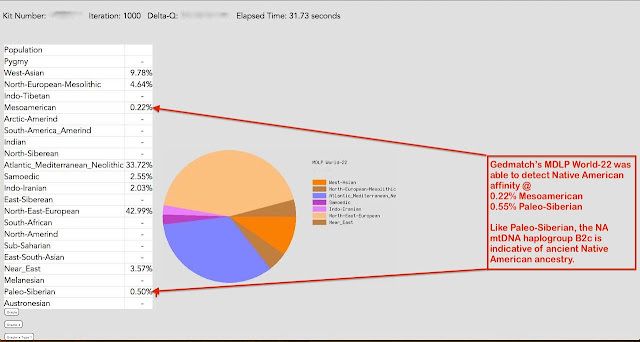 However when she tested at FTDNA, no NA was found because it was below their 1% reporting threshold. So if you suspect your Native American ancestor was very distant it is possible your NA admixture contributions may not meet the reporting requirements. To this point, I also recommend testing other direct-line relatives to find out if they, too, have a Native American haplogroup assignment. 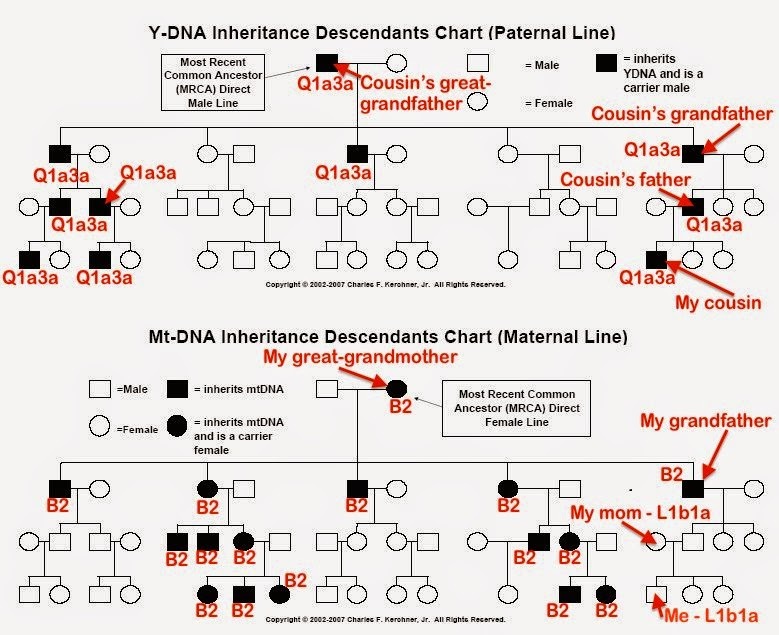 This is how I learned my maternal great-grandmother (with whom I would not share the same haplogroup) is mtDNA haplogroup B2 (see chart below). Several of my great-grandmother's direct descendants across generations tested and results were affirmative for mtDNA B2. 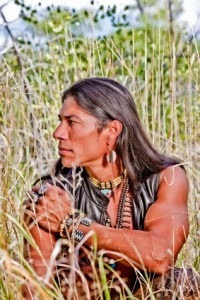 So there really is Native American in my bloodline no matter what some of my DNA tests report! The best tests (USA) for high resolution halplogroup testing is: FamilyTreeDNA, National Genographic 2.0, newcomer TribeCode, and 23andMe (lower resolution); the latter three includes mtDNA and Y-DNA testing along with its atDNA product. Test a parent and other relatives rumored to be the source of your Native American ancestor. Testing a parent may help your learn if you have Native American ancestry. When you test a parent it is possible to have your results phased -- the process of trying to determine what DNA each parent contributed to your genome. If you and a parent test at 23andMe the phasing is performed automatically; but Gedmatch.com offers a phasing program that accepts uploads from AncestryDNA and FTDNA. It is possible your parent might have Native American DNA that was not passed to you. Testing your full siblings and grandparents may also help with clues about Native American DNA in your bloodline. Additionally, your own admixture results may become more specific and you could even pick up some Native American DNA missed before phasing. You should also test your elderly and other direct relatives descended from your rumored Native American source to see if they inherited any NA DNA. Case #2: "RO" is a relative of mines our great-grandmother was said to be Native American. He tested at AncestryDNA, 23andme, and FTDNA. For starters, RO learned that he had a Native American mtDNA haplogroup assignment B2 so there is definitely an Amerindian ancestor(s), but will it show in his atDNA results? The first DNA test RO took was actually at AncestryDNA. His Ethnicity Estimate showed up to 1% Native American, and 3% Asian total (@ 2% Asian Central + <1% Asia East) and <1% Polynesian. 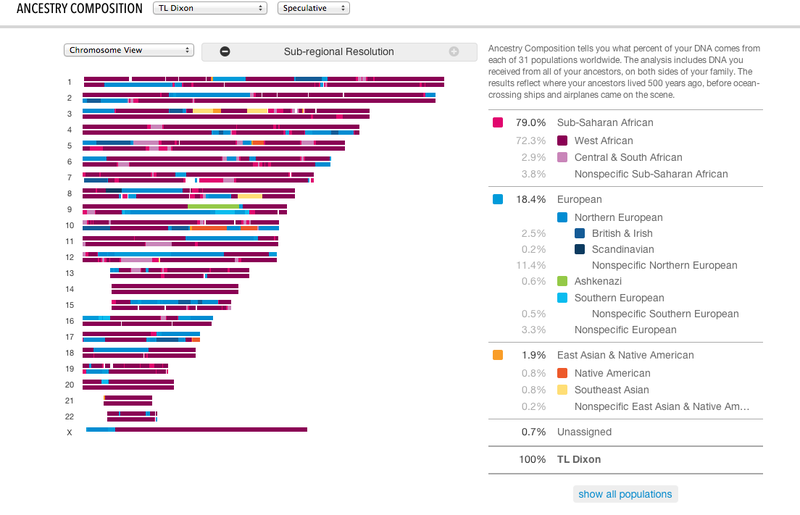 I decided to roll the dice and see what another test at AncestryDNA would show. 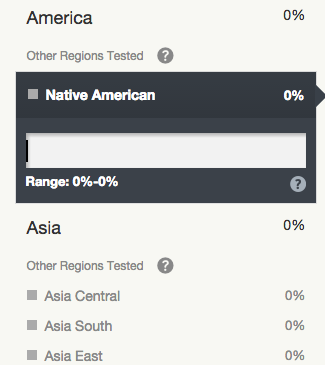 This time I got <1% America (Native American), <1% Asia East and <1% Pacific Islander. Note there was no South Asian detected on this test or any subsequent test I took. but in fact England or Ireland are also as likely as the Eastern Europe. 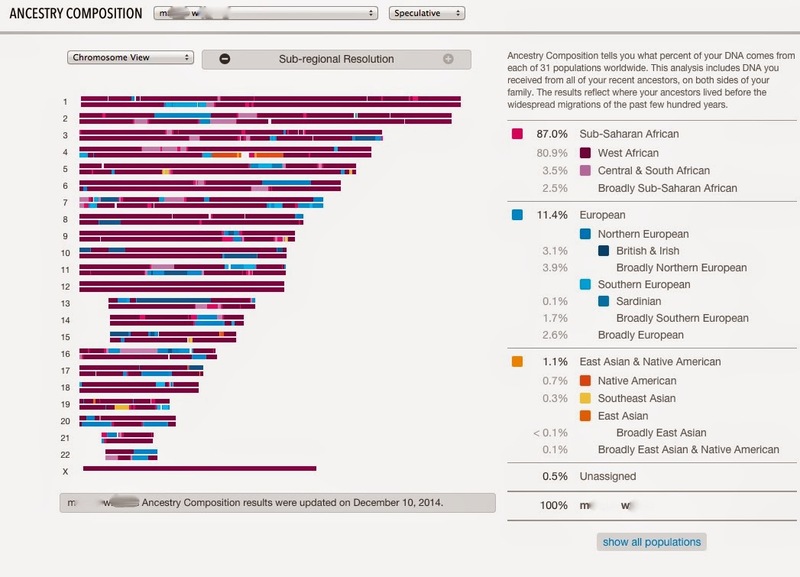 But what Ancestry missed is Native American and Asian, about 1% to 1.3% each. The Mideast is POSSIBLY Sephardic. a bit “east of Nigerian typical”. And yes, there really is American at 1.0%, which is, as you see on one plot, rather hard to tell the exact nature of, but is typical of US Afro-(Euro)Americans. There is also a separate, and clearly real, East Asian of some sort, also at 1%. These two subtract from the European percent. exploring your genetic relatives from DNA tests (these matches could belong to a tribe); testing at more than one DNA company to get a range score of your potential Native American DNA, and to maximize your overall genealogical DNA experience. You must also test other close relatives and elders that are suspected to be the source of your Native American ancestry. Finally don't be afraid to accept the fact that Native American DNA is just not that into you. Good Luck. You're very welcomed NyOkieSue. I am happy you found the post useful. Since haplogroups represent such a narrow line in your family tree, testing your daughter's father or paternal grandfather USING AUTOSOMAL DNA testing will be helpful in seeing if your daughter's paternal relatives received any Native American DNA within the last 500 years. Good luck. Jita'ame; Your name looks Uralic (Finnish? ), and your genetic heritage, if it is Uralic, could easily include deep ancestry from Paleo-Siberian or Ancient North Eurasian, which was ancestral to both later Uralic and Native American peoples. As far as the South Asian potion, that could be something either much, much older-- or--very recent: how strong is it? Thank you very much Jon. I really appreciate it. Thanks for the info! I tested from Ancestry.com DNA my results were 26% American Native Indian, 22 % Irish, 21 %Africa, 27 % American I was wondering if I should test with 23&me to compare the results??? Yes you should also test at 23andme. I have found your site to be immensely helpful to me. I just received DNA results today and frankly I was surprised. I have been studying my family genealogy for the past 15+ years. I got into it because I was told that we had Native ancestry and I wanted to actually prove it instead of believing it. In most cases, I have been able to determine that it is not true. In some cases, the photographic evidence seems likely. I have a gg grandmother who not only looks Native but also is dressed like a Native woman. So today when I got my results and it said that I have 9% East Asian ancestry, I was dismissive. There is no evidence to suggest that there is any direct Asian ancestry. I am aware that there are parts of the South that have mixture of Asian and African descendants but my family is not from that area. Per the recommendations in this posting, I will try again with 23andme. I used AncestrybyDNA. 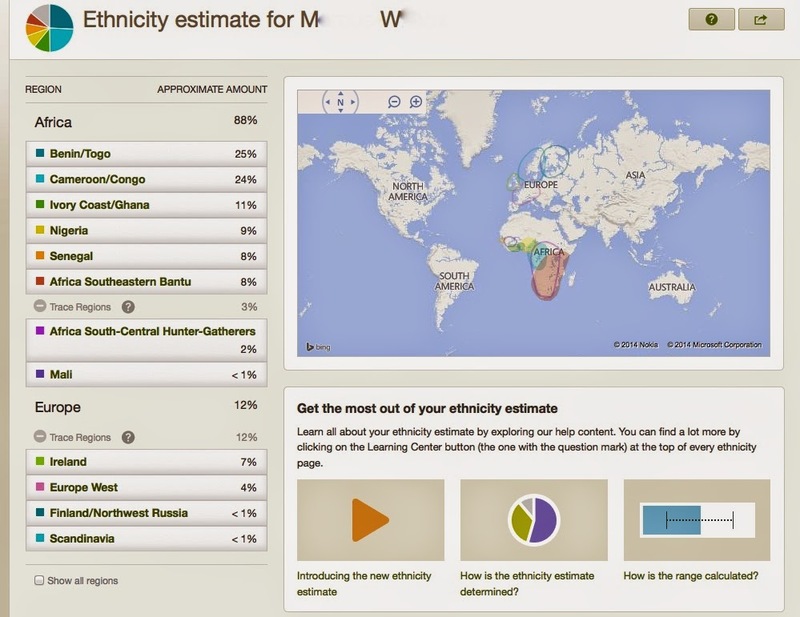 My results indicated 61% sub-Saharan African, 30% European and 9% East Asian. Thanks immensely Shelley Martinez! Yes phenotypes can be an unreliable indicator of genetic ancestry. Can be very deceiving. Indeed. My gently wavy-haired, blond, blue-eyed husband with a rectangular face and tiny cheekbones has some 7-10 times more American Indian and African American ancestry than I do, a very curly dark-haired brunette with dark eyes, and high, wide, & prominent cheekbones on a more square face. I just recently took an DNA from Ancestry and later like to try 23andMe as I heard that these are just estimates and that 23andMe can give you more detailed info like Haplotypes, etc... My dad is a Latino who has family roots in Mexico and my mom is of different European decent. When I gotten my results, I was a bit surprised. It showed 16% NA with the range going as high up as 18% (which seems about right as my dad would be considered a Mestizo); but what shocked me was getting 25% Ireland, 16% Italy/Greece and some Polynesian and Finland and other stuff started showing up. I looked at one of my cousins on my dad's side (my second cousin and one of my dad's first cousins from my grandfather's side, the side from Mexico and his main ethnicity said Native American, Italy/Greece, Iberian Peninsula and Ireland). Since my family does have known roots and records (which not all Mexicans or people of Mexican descent have NA, the majority do at various degrees), I wanted to see just what my genetic said. People are always claiming stuff that isn't true or know nothing about really and I think knowing the truth is what is important. Excellent article Sir, I've looked at the populations and studied the history of the southern tribes. In Matriarchal Societies such as the Cherokee, you were a full blood member of that Nation no mater what your father was. On the other side of the coin, if you were born to a tribal father the tribe considered you as nothing. This changed with the adaption of a constitution during the 1820's. The Dawes Commission at best took a wild guess when it came to blood quantum as many Cherokee had no concept of the word. This could also explain the term "full blood" in many of our family stories. Thanks TheMarks51627 ... Blood Quantum is an interesting concept. However it is determine without ethnicity admixture tests so we really don't know how much Native American DNA these full bloods had. Thanks for the really interesting articles. I never considered this possibility of Native American ancestry, but when I started using the calculators at GEDMatch, they started showing Amerindian in the magnitude of 1% (+ or -). Ancestry.com DNA does not show that. Then I have since discovered that it seems I have colonial American ancestors going back to 1612 in New Hampshire, and ancestors who lived in Newfoundland for several hundred years. So that makes an actual Native American ancestor more possible. I had thought that northern Europeans could show up with Amerindian because of the shared DNA with the ancient Asian population that went both to the Americas and across Europe. How can one tell in that case between that population and actual Native American? Question: Did AncestryDNA show Native American in the RANGE score (you can see this by clicking on the Native American category and a drop-down box will appear). If you have early colonial ancestors there is a possibility of them intermixing with Native Americans at some point. Of course if you had 1% from one ancestor or event in your family then you would be looking at an ancestor who might have existed around the year 1800. Thanks TL Dixon for your response. AncestryDNA did not show any Native American. I am a European mix 99%, and 1% Middle East. (Happy to give the exact breakdown if it helps.) My ex-husband whom I reference below is European mix 99%, 1% West Asian on Ancestry.com. But for reference, my ex-husband, born in Denmark with no American ancestors, also shows up with Amerindian components. In fact, often more than me. So that's why I am suspicious. I tried to copy in all relevant components from each test. HarappaWorld, Papuan 0.47 American 0.76, and 0 Siberian and 0 Beringian. AncestryDNA does say I have 1% Finland/Northwest Russia (which I find believable with my Scandinavian ancestry). Coincidentally, so does my ex (1% Finland/Northwest Russia). So I hypothesize Siberian and/or Beringean results might be related to that. So you see my dilemma - if I see these results as evidence of me having a Native American ancestor, the evidence possibly seems stronger for my ex, but that can't be. So that makes me think that I'm just seeing the evidence of Siberians and Huns in Scandinavia, Britain, and continental Europe. Hi Mr Dixon, I am a one of the card carrying Ramapough Indians that you mentioned above. I did take the Ancestry DNA test in their first Beta stage and it did not show any NA ancestry at that time, but did show 6% East Asia and, 76% AA and I think at the time there was 26% unknown. When they did their first update it came back with 3% Native Native American and a trace 1% Polynesian. Also include 3% of the following Scandinavia, Italy/Greece, Russia/Finland, I think it was 1% Ireland and Caucasus. I may be missing something,since I don't have it in front of me. 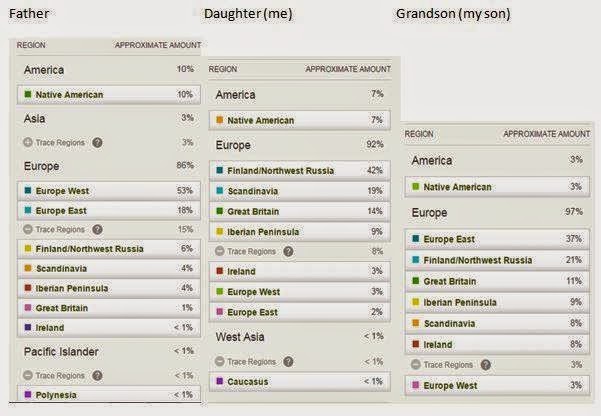 Just as other's believe from oral history I thought it would be more because on my father;s side, my grandmother from Virginia always said her grandmother was full-blood Indian. My mother's side is the Ramapough side, and I grew up the NA way of life always knowing I was AA and NA and some Dutch, but no Dutch was detected in my DNA, but as you said it does not necessarily have to show up. The Ramapough people come from long generations of ancestors that knew they were Native American, it was never a question about were they or were they no, and they passed it down through the generations, but we were always told never to let anyone know we were part Native American. We really came out of the closet not many years ago, because we got tired of people that knew nothing about us defining us. Most people think that the Ramapough people woke up a few years ago and decided to call themselves Native American, but that is as far from the as it can be. Yes we have many in our Tribe that would rather be considered Caucasian because they look Caucasian, and therefore they want no part of their NA Ancestry and some want no part of their AA ancestry. I specifically took the DNA test, because I wanted to see if what people were saying was true, that we had no NA ancestry at all. If this was true, I did not want to continue identifying as NA also. I am a person that wants to embrace all of my ethnicity no matter what it is. Also many of my Ramapough relatives and members are on Ancestry and have taken the DNA test, and we have all matched together with definite Native American ancestry. The only problem now is I don't know if it is from my father's side and his great grandmother if she was full-blood Native American or my mother's side. Her De Groat great grandfather and his brothers were listed as 7/8 Indian in the 1870 Monroe, Orange County, NY Census. The Genealogists Roger Joslyn that did our Tribal Genealogy listed his father as 3/4 Indian. I have only taken the Ancestry test and do plan on doing another one from one of the sites you mentioned. Unfortunately my mother passed away in 2015 before I could afford to have a test done on her. My father's brother's son is living and I plan on having him tested with the Y test only, which is more expensive than the Ancestry Test. I must use that test for him, because his mother is also a Ramapough. I would like to thank you for all your research information and sharing it with all of us. It has been very informative for me, because it has verified a lot of what I believed about the DNA test, especially the East Asian connection to NA. @CDeGroat thanks for your inspiring comment. In Ramapough Indian admixture profiles that I've reviewed there is definitely shared Native American DNA and some evidence of introgression from other tribes and endogamy. There are even some Native American haplogroups that seem to be frequent in Ramapough. But there is also a Malagasy (Southeast Asian+Bantu Southeast African) element. There is also Dutch but this is expressed as generic Western European or German/France on DNA tests. From a DNA perspective it is best to test as many elder family members and other close relatives as possible. More than likely you have Native American DNA from both parents, and possibly even more than 2 grandparents ... I'll also briefly share that my grandfather's maternal side is from Colonial New Jersey and New York, and his mother carries Native American maternal haplogroup B2 (this means there was a Native ancestress on his direct matrilineal line). Two of my elder cousins are related to Ramapough but still trying to figure it out. Please reach out to me @ KingGenomebyTLDixon@gmail.com for further discussion. Not sure if you can answer this but my wife is from the old GDR(East Germany). Hence her family has never been to the US and confined to Bessarabia. Yet her GED match show traces of Amerindian. Keeping in mind that people of the old GDR are really Native Russ. How is this possible without stepping foot on US soil? You're welcomed. Well 5% to 6% indicates there is clear Native American ancestry. Your AncestryDNA RANGE SCORE may show more and be consistent with GFG. If you have not tested a parent then we may not if the NA is from one or both of them. my pat haplo is a1b1; mat group U5a, with Saami connection;overall, mostly Northern European; 3% Iberian; "no Native American," except everyone knows my father's father was a status by blood quantum Native American; and he, we his children, and also his sister and her children have distinguishable 'Indian,' features, facial, body. Our interests, our attitudes, reactions, all fall within those traditional to near ancestors. By these measures I have been an Indian all of my remembered life.We only want to establish that we belong, not to cash in on any benefits. Oddly I don't care a darn about the European ancestry, not remotely curious. Any comments appreciated. If native americans are genetically related to Asians, why do Asians have mostly b blood type and the b blood type almost never occurs in American Indians--they are almost all type o. The Amerindian autosomal genes are such a small percentage that it's easily 300-500 years deep. Another analysis that reduced you to two recent populations showed 97% Norwegian and 3% Spanish. Spanish!?!?! Maybe that's the meso-american link? Any ideas about where I could find records of who the Spanish took back to Europe? Closing this from both ends in Europe: my great great grandmother who immigrated to San Francisco, and follow the female offspring of the natives taken to Spain seems nearly impossible, but a very interesting puzzle! My Ancestory DNA test showed no Native American DNA. A male cousin did same test and came back 25% through the male lineage (my dad's family). We have documented Cherokee in my dad's paternal grandmother and my mother's paternal great grandmother. Why did nothing show up in my DNA? I thought the test did both male and female lines of both parents. But this test result was the same as the Nat. Geographic test I need several years ago, just on my mother's female line? Maybe one of your ancestors cheated the partner and you got different ancestor. This happening today lots, so maybe in the past too. No cheating went on and no my ancestors were not Cherokee princesses. My ggggrandmother was Nancy Bridges a Cherokee from NC. The other was Nancy Foster, a member of the Deer Clan. I am also a descendant of the Oxendine family, Lumbee nation. My DNA has been matched with all of these people on Ancestory's family circles. I think the fact that this lineage was through my dad and my mother'said dad was.the reason. Although it did match me with members of both families in the groups. Could of been a captive European. If your cousin got 25 % you should have received some also. Or maybe he received his NA DNA from his mother. If you tested twice with two different tests there is obviously no NA DNA in your Genome. If both you and your cousin's parents would test it would clear up some of the mystery. My sister and I used the same test, yet she showed 28% more of a country we genetically share in common. I tested heavy West European,and 8 diff African countries, she tested no West Europe, but 12% British and 3 African countries. On three sepatate test I showed 1.5%+ Native American, my sister showed 0%, yet on the same test,she showed 2% Ashkenazi jewish, I showed 0%-we are the only biological children of both my mother and father*. 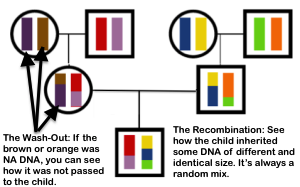 Genes are just random. Your cousin may also get Native genes from his maternal side. It is good to test as many generations back, and the older living family members will yield the greatest number of answers to your DNA challenges. But most importantly, your oral and documented past living history, heritage and legacy are the greatest tools in your genealogy-DNA just adds that extra link to more people, and your earliest/ancient ancestors. You are right. Very interesting. https://nativeamericanroots.wordpress.com/ This may help. There is a community in Granville, NC that is tri-racial. The Saponi's were there too. I believe the Oxendines were multi-racial too. Also check the Lost-Creek.org website lots of info there. There is a women that has close ties to that community and the native american blog through the link in the beginning of my message here; her name is Kianga Lucas she ma be able to help you. Why were your results different when you re-tested at Ancestry? I have a pretty good ancestry.com New England family tree representing 1/4 of my ancestors. Although most were English who lived in villages based on common beliefs and religious tests, a few seemed to be pioneer types who pressed into the then-wilderness. In two areas, they are documented as having worked side-by-side with Native Americans (Long Island whaling and fishing and Connecticut River fur trapping (as in Deerfield) where they encountered French Canadians and Native Americans. A number fought in the Pequot War in Connecticut and Rhode Island. Some of family members were actually captured and held by Indians (the Stebbins family and others). When 23andme sent me my genome, I learned that unlike many of my cousins on it, I am not 100% white, but .3% East Asian and Native American. I do not have mtDNA indicating this. My mother is Irish and most likely 100% white. It is my father with the New England (and continental European) heritages. He is the one whose family settled in the present USA in the 1600's. It is true that his mother is from immigrant stock, said to be Prussian, but actually Hanseatic with a lot of Scandinavian and some small Eastern European (1/3% is what I have probably from her) and Finnish (less than 1%). Since she is long dead I don't have the certainty of deriving those admixtures from her, but she is the most probable source. 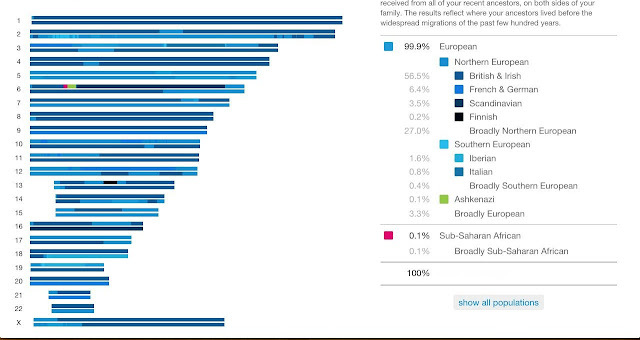 Of course my 4.3% Scandinavian may derive in part from an Irish mother. My largest percentage is British/Irish (indistinguishable) at 75.4%. If the East Asian is Native American (and it is otherwise unlikely to have come from the British 3/4 directly), then it comes from about seven generations back, in fact to the era when my New England family was in close contact with both Native Americans and French Canadian probably Meti fur trappers. There are records of actual direct ancestors spending time in Native American villages (one, captured as a boy, is the well-documented Benoni Stebbins, who later died in the so-called Deerfield Massacre). Several participated in the Pequot Wars. It is possible too that my East Asian heritage may derive from Eastern Europe (though that is such a small percentage, and it would mean that such an ancestor would have had a lot of Asian features). Other than the knowledge of proximity to Indian villages and working with Native Americans historically, I have no family stories. I am a Mayflower descendant, and they did not even tell me that (my father was a New Yorker and more proud of the Dutch strain). So, am I some kind of Algonquin or just a generic Siberian? I know they are related, but something more specific would be fun to know. Back in the family tree are several women without surnames who fall right in the generations with Indian contact. Most women back then who were not listed with surname were not neccesarily hiding Native American ancestry. 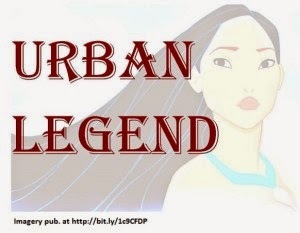 I have heard a lot of speculations about Native Ancestry with these nameless woman. For the most part women were not as important as men, and were not recorded properly. Same with my white ancestresses. Also Northern Europeans do share Ancient North Eurasian (Siberian) so that ancestry comes out as NA, and is most likely ancient. I really wish these DNA companies could tell what Native American Tribes. My dad never knew his father, but was told he was a quarter Cherokee. I always wanted documents on that. But me and my dad don't look Caucasian. I was always asked what my "mix" was. Everyone thought I was euro-Asian or Native American. So finally I did the AncestryDNA. It says 6% Native American. Just wish I had documents and wonder if I could get documents on my paternal grandfather, if it's enough percentage to sign up with a trube. You would have to get all Native American Nations tested to find out which tribal grouping you would belong to, but that probably is never going to happen. There is no reason for Native Americans to test, no benefit at all for them, the only people who benefit are the geneticist and the general White And Black American public who are looking for that one Native American ancestor out of thousands of European, African and Asian ancestors,. Besides that most of the East Coast natives are heavily admixted with other ethnicities. The only way to get DNA from Native Americans is testing ancient remains as they become available, though the Natives will fight that also, because they don't like the desecration of their ancient forbearers. Even that won't tell you where your ancestors came from because modern tribes are now mostly thrown together people who are mere remnants of great genetically diverse people that were here before the European and African invasion of their homelands and Genocide. DNA can't bring them back and it will never be able to tell you what tribe your ancestors came from. My sister and I were always told my father was 100 percent native - we both just did the ancestry.com DNA test and she came back 24% and I came back 25%. I wish more NA would test so we could have more information available. But you’re right, they have no incentive to. Most the ‘card carrying’ NA’s I know are as white as it gets and if there was a way to prove they weren’t Indian by taking a DNA test they’re going to stay clear of that! I auditioned for FTDNA and when played in gedmatch appeared new resuldados. Is there a website where I can download the results generated in gedmatch and a map? Excuse me for the English evil, it is that only speak Portuguese and Spanish. Hello. My name is Heather and my grandfather on my mother's side was full-blooded Blackfoot Indian! So I did a DNA test on ancestry.com and it came back that I had no Native American blood in me once whatsoever so I was really upset and heartbroken. So how do I go about testing it with the place you're recommending? Do I have to go back to ancestry.com and try to find my results? I had this done over a year ago so I'm not sure what to do? Can you please guide me in the right direction. Thank you. Interesting article, thank you for sharing. I am just starting this process for my son. We did is DNA test and his Native American percentage was 8%. His father was adopted and believes his birth mother carried the descent. Is there a test you can recommend that will show specific tribes? Thank you in advance. Your article is a perfect example of how the Internet can be a good thing and why we shouldn't destroy it. ;) Impeccable research and clarity. Just received my sister's 23andme results and we're all astounded to find less than 1% NA. Should be interesting to see how this pans out, since dad has passed and it was supposedly his grandmother who was Cherokee. We'll have to swab our uncles and hope something comes through. That <1% could be the watering down you describe, though. Thanks for your expertise. Your article is a perfect example of how the Internet can be a good thing and why we shouldn't destroy it. ;) Impeccable research and clarity. Just received my sister's 23andme results and we're all astounded to find less than 1% NA. Should be interesting to see how this pans out, since dad has passed and it was supposedly his grandmother who was Cherokee. We'll have to swab our uncles and hope something comes through. That <1% could be the watering down you describe. Great, great article. Thanks. No it was through the paternal side. Ironically, one of my son's did the 23andme test and it came back 4% Native American through his maternal side, that's me! I think these tests have a long way to go, but they are interesting. Please upload your DNA to GedMatch! My ancestors have been here since 1600s. I used 23andme & no Native American results, Mixed European. My GedMatch shows small amounts of Native American & Others. I had the Indian Princess story in my family as my father explained that we are part Indian and wanted me to be proud of it because many still look down upon Nationalities prejudice. I am proud of my bloodlines. I came from Mountain People, hard working & strong people. I am a mixed bag of things & proud of it. I love this site! It's history is wonderful! I will share it with my Grandchildren! Please upload DNA to GedMatch. My Native American DNA showed up there. My ancestors have been here since 1600s. I come from Strong, Hard Working Mountain People. We are a Mixed Race. My father told me the Indian Princess story also, he wanted me to be proud of my Indian bloodline. Some still have prejudice views regarding Nationalities. I am Proud of my DNA. I Love your site and will share it with my Grandchildren! 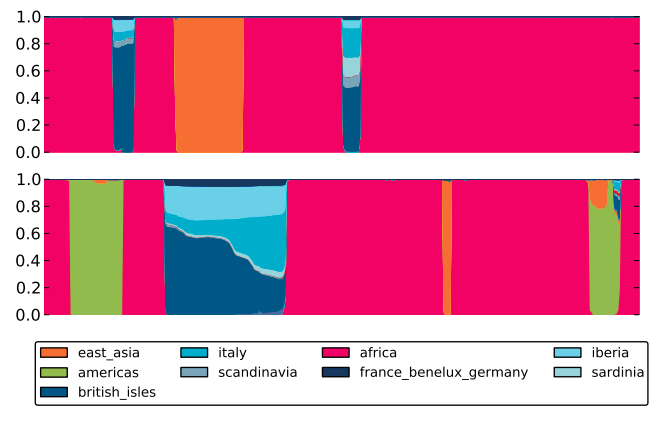 I use GedMatch Admixture Eurogenes K13 to give a quick piechart snapshot of origin components. 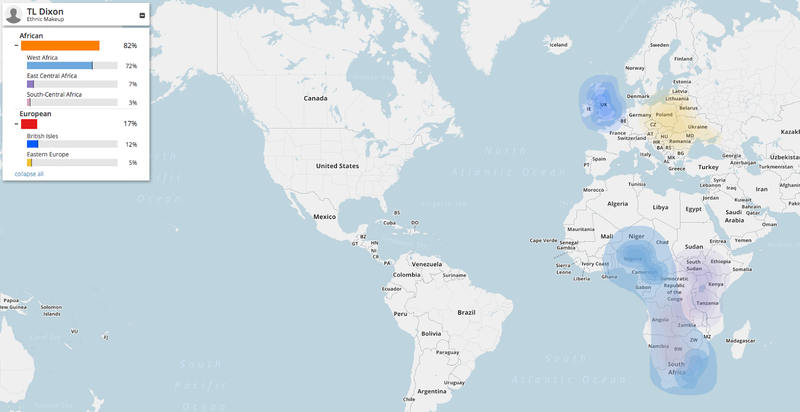 Maybe the tool is not very accurate as it does show Amerindian at between 0.42 and 1.33% for all six members of my wholly English/Irish resident family who have uploaded there. I show Sub-Saharan 0.31 and my daughter 0.17%. Any thoughts? Very helpful! Thank you!! I wasn't sure how to use GedMatch to get more info on my Native American ancestry, but now I have a clearer picture and better understanding of migration based on DNA that matches history! I am Mexican by blood, which as history goes we are a general mixture of Native American, European, and African (+/- a few others) so I had already expected to see that on my AncestryDNA, but not sure what percentages. I was able to see overall from both tests: 43% Native American, 51% European, and 6% African! The awesome part of the tests you cited, was that I was able to "break-down" the Native American DNA that AncestryDNA does not...I have matches from East Asia, Alaska, California, Mexico (obviously) and Colombia!!! The region that my family is from, Michoacán, México, is made up mostly of the P'urhepecha, but it's interesting to see the DNA make-up. Gracias! Downloaded ancestry DNA to gedmatch, what do you look at to say that is na dna? There is still a chance NA is not assigned entirely. However, unassigned as in their "unassigned" population category? Or is it labeled something else (East Asian category, possible Euro)? Back in the days of Ancestry Painting, Native American was detected by the East Asian signal. NA markers were missed being assigned European. When the new model for Ancestry Composition was introduced more Native American was assigned. The only panel groups for NA are South American and Mexican Pima’s. They need to add in Alaskan Natives/NA Natives as further extremes as they carry more of the East Asian signal. I believe for the most part, Native American is found in the genome (if present) most of the time. If you do have Native Ancestry, should be detected however, you may have markers not assigned or being defaulted (possible) to the next closest population. As mentioned the Recall Rate 86%. As such, your DNA segments may be erroneously modified if it doesn’t “fit” the training model. To what degree, we won’t know. No report is provided how many times your genome was corrected or re-assigned. 23andMe is good and it is very unlikely it will completely “miss” primary ancestry in your gnome on a geographical level. Great article. Multiple members of my family tested about 7 years ago. I bet it has come a long way. Results were vague to say the least. Most had check marks on regional areas mostly. We know positively that we are high percentage Native, but the results were odd. Most of the areas came back as Mayan, Mestizo, areas in South America as well as Ojibwe. We cannot find any Spanish, Mexican or Central/South American ancestors on paper thus far...so could any of those groups be misinterpreted due to limited full blood native samples? Could the mestizo be used rather than nailing down a tribe? Its astonishing how a brother and sister can have such huge differences as well. I'm just so shocked about the mestizo and South Am. ancestry. My brothers came back with so little European ancestry, almost non existent. This was an excellent post. Thank you for breaking down this very complex topic and making it much easier to understand. You also demonstrated the wisdom and necessity of getting more than one DNA test. Extremely interesting reading but what would you make of results that go the other way? I am over 50% South Asian , 35% European and 4% Native American as my main ethnicity with traces of East African at Ancestry, FTDNA and Gedmatch . As far as I Knew my Asian and European ancestors lived and loved together in British India for a couple of hundred years. I’m about to test my 23andme results at FamilytreeDNA as I too discovered a small percent of NA DNA which I found interesting. Colonialism may explain the surprise, as I initially thought my family genealogy would show as completely East Asian and a tiny bit of Spanish ancestry. Instead it was East Asian/Native American, the NA DNA back to a 4th great-grandparent, on maternal line. How can one explain the dark-skinned Native Americans? Most early pictures I have encountered showed dark-skinned and straight hired Native Americans. Recent DNA analysis of the Mal'ta-Bur'et skeletal remains found in Siberia, show that they were ancestral to both Paleosiberians and Europeans, and Native Americans. These people were also a 'medium brownish-red' in skin color. Lighter skin apparently didn't evolve in Eurasia until about 12,000 BC, after most of the Paleo Indians were already in N. and S. America, but about 1000 years before agriculture. How do I download my results from Ancestry to GEDmatch? Hello i need your help. I am a black american(born in NY-USA) with two black parents that was born in Grenada. Grenada is mostly of Black/African and Indian people from what I recall(I live there for about 3 years as a child). I did my dna test from ancestrydna and my results came back 97% African, 2% Europe South & <1% Caucasus(West Asia). No Native American ancestry. Plus i can't trace my family history(family tree) because records was either lost, not recorded or not advance in the Caribbean. Plus both my grandparents are dead and I am having a difficult time creating a family tree. I uploaded my raw dna to different sites. For myfamilytreedna i got 94% African(with <2% S Central), 4% European and <1% Native American. My Dna.Land came back 93% African and 5.5 West Eurasian(3.2% North Slavic, 1.3% French/Spanish-France/Spain, 1% Ambiguous). 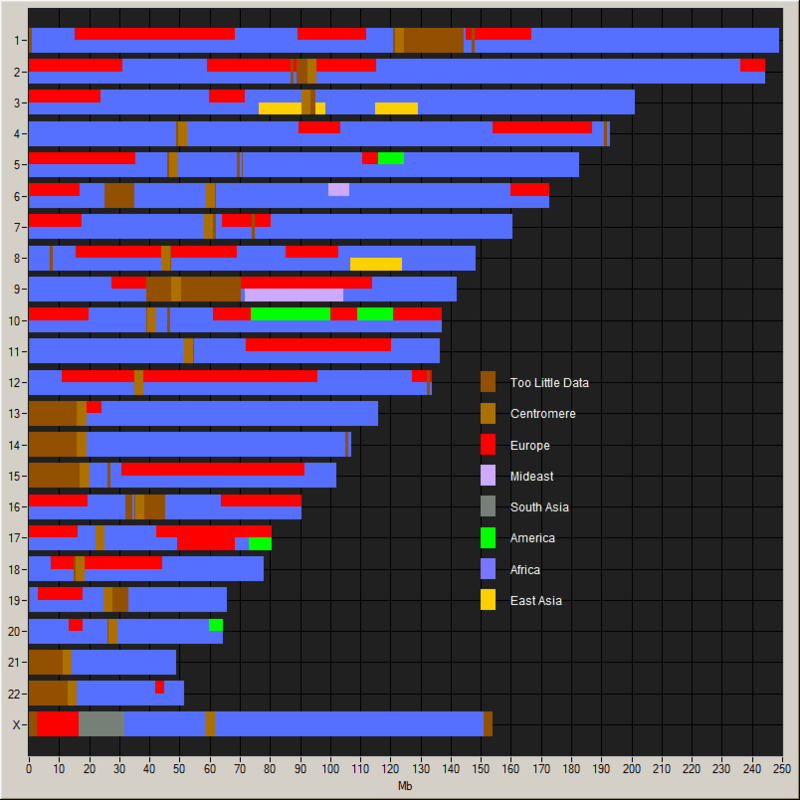 Sequencing came back 98.75% African, 0.54% European, 0.45% Asian, 0.13% Native American, and 0.18% Oceanian. Myheritagedna came back 98.4% Africa(85.2% West Africa, 11.9% East Africa & 1.3% Central Africa) and 1.6% Europe(Ilberian-Spain/Portugal)..No NA. 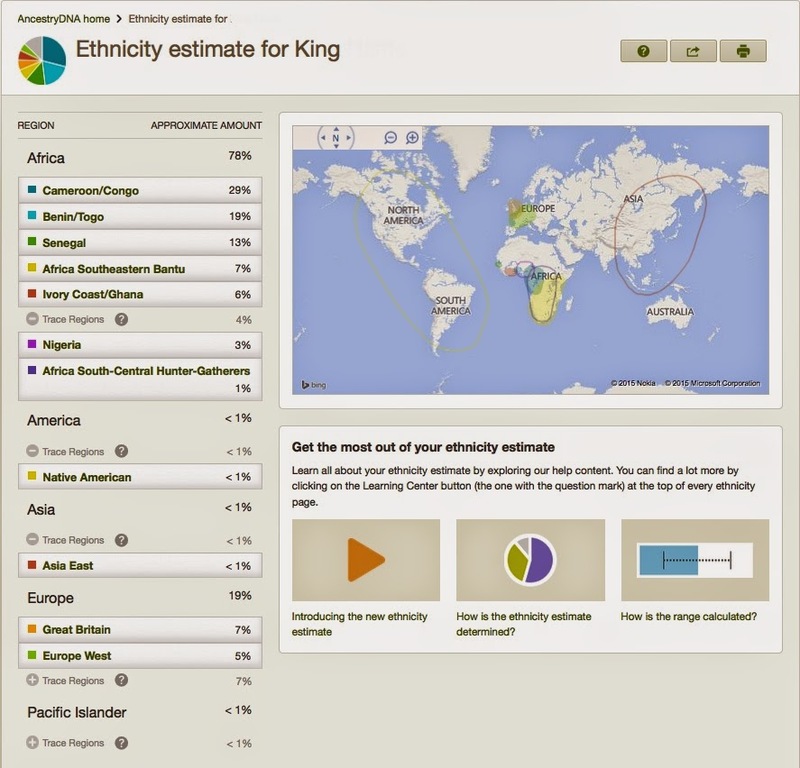 Lastly I use Gene.Plaza and using the K29 Admixture Calculator, it says 95.7% African(87.9% WA, 7.7% EA), 3.2% Asian(Iraqi & Georgian Jew), 0.8% European(East Slavic), 0.4% Oceanian(Australian, Papuan) and 0.0% Siberian/Amerindian. Questions: Why does my Native American percentage shows up on some sites and not others? Should I use other tests and test my other family members? Also i dont know how to trace my family tree/history due to the fact that both my grandparents was born in the Islands and they are dead. How can i trace my family history? Can anyone help me? Thank you!!! This seems to be the most insightful,scientific article explaining non existent Native American DNA results i have readread. I have to admit I have to scrutinize my supposed Cherokee ancestry since my genealogical research shows no person acknowledging them as a indian. And I haven't seen any evidence of them living in Oklahoma or Arkansas. Alright great grandpa looked likeh he had an olive or light brown complexion. My dna results showed no native american, Scottish or Scandinavian results. I'm mostly English and about 95 Northwest European. With trace amounts of Iberian and North African dna. so much for finding a Siberian in the proverbial woodpile . C'est la vie. Ancestor showed no Native American on my DNA test. My son did the 23and me DNA test, his showed 4% NA through his maternal ( that's me) side. Even said Algonquin and Siouan tribes, which goes with the rolls and family information. Very interesting article. I was always told that my great grandmother on my maternal line was a Romany gypsy. I've found little to prove this so far, although there are a number of ancestors with surnames which could indicate a connection. I was surprised to discover last year that I had 1.5% native American DNA. I'm not aware of any native Americans within my ancestry and wondered if the Romany line would show up as native American? I also have a percentage of South Asian.